Birthday Wishes for Aunt: Wish your auntie a happy birthday by writing something sweet on a greeting card. For an aunt, her nieces and nephews are no less than her own children. So show some love and put some though into writing cute quotes and funny messages. Post them up on Twitter, Facebook and Pinterest. Top all this off with a nice little gift to make her feel like the luckiest aunt in the whole world. The relationship between an aunt and her nieces or nephews is a cool one. It can conveniently go from being like a parent-child relationship to being a bond shared by best friends. Encompass this special tie and make sure you let your aunt know that she is not just the coolest one around, but your favorite too. 1) Forget Superman. 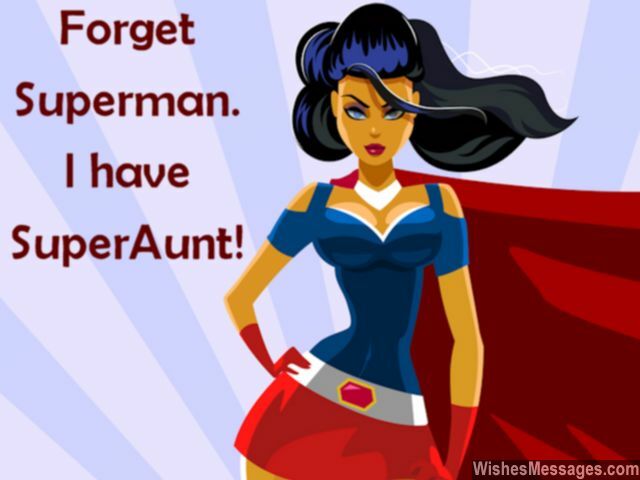 I have SuperAunt. Happy birthday. 2) I don’t know whether to call you my parent or my friend, but I pray that our sweet relationship never ends. Happy birthday. 3) Happy birthday to my three-in-one… aunt, godmother and best friend. 4) Dear aunt… you are to me, what my parents can never be. Happy birthday. 5) Thanks for teaching me that an aunt-niece relationship can go way beyond family reunions, weekend barbecues and Thanksgiving dinners. Happy birthday. 6) My aunt is an important pillar in my life’s structure – the only one who is rigid enough to bear a heavy burden yet flexible enough to allow me a lot of fun. Happy birthday. 7) Like a dust jacket and a hardcover, you and I will always be together. Happybirthday #favoriteaunt. 8) Happy birthday to the aunt who spreads joy everywhere she goes, and in the life of every person she knows. 9) Dear aunt… I may have inherited my mom’s grace and my dad’s intelligence. But I’ve inherited your ability to make the best of what I have. Happy birthday. 10) You should write a book called… Being The Coolest Aunt for Dummies. Happy birthday. 11) Dear aunt… You are a parent minus the fighting, sibling minus the blaming, friend minus the betraying, mentor minus the obliging and a guide minus the preaching. Happy birthday. 12) I love you but my mom hates you… because you spoil me rotten. Happy birthday. 13) I’ve never missed having grandparents because I’ve always had you to spoil me rotten. Happy birthday. 14) Although you are much elder to me, I never understood the meaning of the phrase generation gap because you have always been a friend to me. Happy birthday to my favorite aunt. 15) Dear aunt… thanks for being the parent who I can share all my secrets with. Happy birthday. 16) It’s very simple. I love my aunt. 17) My biggest inspiration is my mom. My biggest influence is my dad. But my biggest dream is to become as amazing as my aunt. Happy birthday. 18) Dear aunt… when everything in life seems to come to a halt, your advice is the only push that helps me move forward. Happy birthday. 19) Hi… this is to remind you that as my aunt you are officially allowed to spoil me and as your niece I am officially allowed to tell you all my secrets. Happy birthday. 20) Dear aunt, you are the mom that never scolds and the best friend who never betrays. Happy birthday. 21) Dear aunt… the best part is that our relationship doesn’t depend on the grades I get because you love me regardless. Happy birthday. 22) Dear aunt… even all my BFFs put together can’t match your presence in my life. Happy birthday. 23) I can’t wait until you have kids… because I want to be an amazing aunt to my niece or nephew, just like you have been an amazing aunt to us. Happy birthday. 24) The only reason I was never scared to make mistakes when I was young is because I knew that you would always be there to defend me in front of mom and dad. Happy birthday to the best aunt ever. 25) You should take classes to teach other women how to be fantastic aunts to their nieces and nephews. Happy birthday. 26) I officially declare your birthday as Aunt’s Day from now on because your contribution in my life has been nothing less than that of a parent. Happy birthday and Happy Aunt’s Day. 27) I have always been your mischievous nephew and you have always been my loving and tolerant aunt. That is a match made in heaven. Happy birthday. 28) You deserve the best in life… whether it is a top notch promotion, luxurious holiday, beautiful apartment, cool car or an awesome nephew like me. Happy birthday. 29) The word AUNT was destined to be a part of the word FLAUNT because in front of my friends, I like to flaunt how cool an aunt I have. Happy birthday. 30) Everyone gets tired of doing a full-time job but aunts like you never get tired of their full-time job, which is loving and pampering their nieces. Happy birthday auntie, we love you. 31) Mom – Nagging = Aunt. Happy birthday. 32) You are an awesome sister to my mom, awesome sister-in-law to my dad, awesome wife to your husband and an awesome aunt to me. Is there anything in life which you are not awesome at? Happy birthday. 33) To my favorite aunt… your happiness and your energy are the only contagious things I’m happy to catch. Happy birthday. 34) Just like important documents and data in computers need backups, mothers need backup in real life too. That is why Gods created wonderful aunts like you. Happy birthday. 35) Aunts are like pillows – necessary, comforting and soft. Happy birthday. 36) There are lots of things that I wish my parents did differently in my childhood. But the one thing I am glad my parents didn’t do differently was to appoint you as my godmother. Happy birthday to my godmother aunt. 37) If you weren’t a part of our big family, by now everything and everybody would have gone crazy. Happy birthday. 38) Dear aunt… you birthday is probably the only one I don’t need to be reminded for, by my iPhone or Facebook because I remember it by heart. Happy birthday. 39) I will be unhappy on your birthday today if I can’t manage to make you have as much fun as you made me have on mine. So let’s get started and let the party begin. Happy birthday auntie. 40) Aunts like you are perfect for nieces like me. I thank the heavens for making you a part of my destiny. Happy birthday.